How do I set up a Join task with Salesforce? How do I use Join with Salesforce conversion data? AdStage Join allows marketers to connect paid ad performance data with Salesforce lead conversion data in order to discover how many down-funnel conversions come from each network, campaign, ad set, or ad. 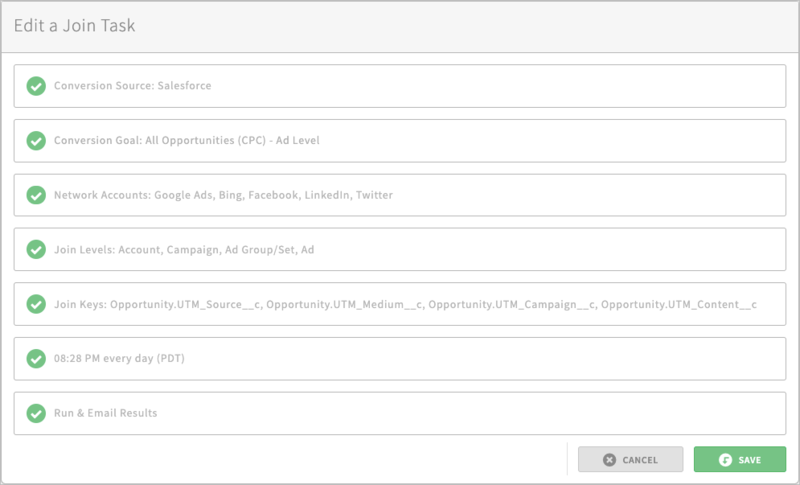 Join works by connecting your Salesforce (SFDC) conversion data with the paid ad account, campaign, ad group, and ad from which the conversion came via UTM parameters. Simply create a UTM report in SFDC (details below) that includes the lead data you want to "join" with your paid ad data, and use this report to drive your Join custom conversion. Follow the steps in AdStage Join to pair your SFDC report and ad accounts together, choose a level of granularity, and then schedule how frequently you want AdStage to join your data. Step 2: Navigate back to AdStage and click on Join by hovering over the Data Management Icon on the left-hand sidebar. Step 3: Click the “Create New” button on the top right-hand side. Step 4: Choose Salesforce as your conversion source. Step 5: Select "Created_Date" as your Conversion Date, then choose the SFDC report you want and enter a name and description for the custom conversion. Pick a Conversion Value from the drop-down on the right. Step 6: Select the ad account(s) you want to join with your SFDC report data. Step 7: Select the Join levels of granularity you’d like to use for this custom conversion. Step 8: Match your SFDC keys with your network keys by selecting the corresponding options from the drop-down boxes on the right-hand side. Step 9: Choose a lookback window for which AdStage will pull conversion data, a “use data from” time range, and frequency for how often AdStage will pull conversion data. Step 10: Name your Join task and click Save. Today Join for Salesforce does not support custom parameters. This feature is coming soon! The user who connects Salesforce to AdStage must have access to the Salesforce report you're planning on using in your Join task. In addition, the Salesforce user must have the permission "API Enabled." Salesforce has some documentation on permissions here.